Don’t be put off by the title, this isn’t a book about farts – it’s a book about fabulous art and being creative. Geelong Visual Arts teacher, Dale Baker has created a fabulous picture book that celebrates creativity. In fact, it’s so good, it’s just been shortlisted for the children’s choice 2018 Yabba Book Awards. 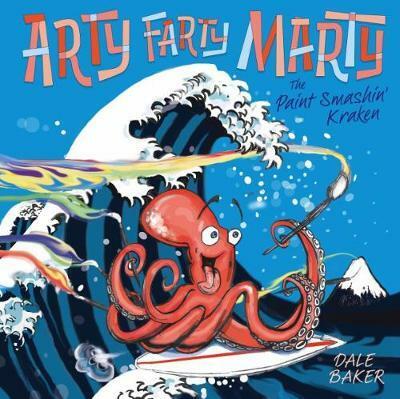 Kracken, Arty Farty Marty, loves to surf and paint, sometimes at the same time. Marty particularly likes to paint in the style of the world’s greatest artists, including da Vinci, Van Gogh, Dali and Monet, but with his own twist. Filled with vibrant and joyous illustrations, this rhyming book is a perfect to read aloud and is a great introduction for children to fine artists. The book even has facts about the artists featured, and a sneaky piece of Teenage Mutant Ninja Turtles trivia too. You and your early school age children will love Arty, Farty Marty!